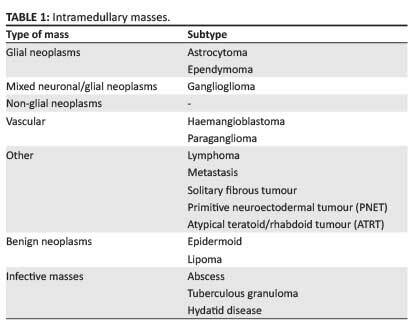 Six histological subtypes are recognised; of note is the myxopapillary subtype which has a predilection for the conus medullaris and filum terminale, and represents the most common conus neoplasm. 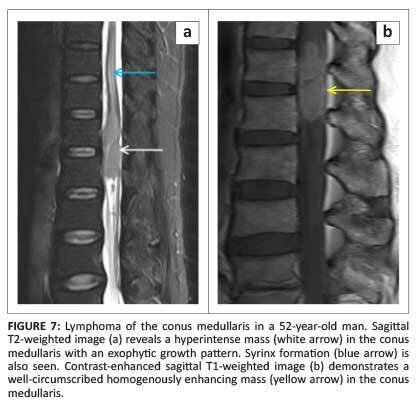 These neoplasms occur predominantly in young men and may occasionally demonstrate high signal intensity on both T1WI and T2WI, a finding that reflects mucin content or haemorrhage.1 However, the imaging findings are generally non-specific and the conus medullaris location should be suggestive of the diagnosis (Figure 2). Unlike their intracranial counterparts, spinal astrocytomas often demonstrate patchy post-contrast enhancement. They are usually eccentrically located within the cord and ill-defined owing to their infiltrative growth pattern. 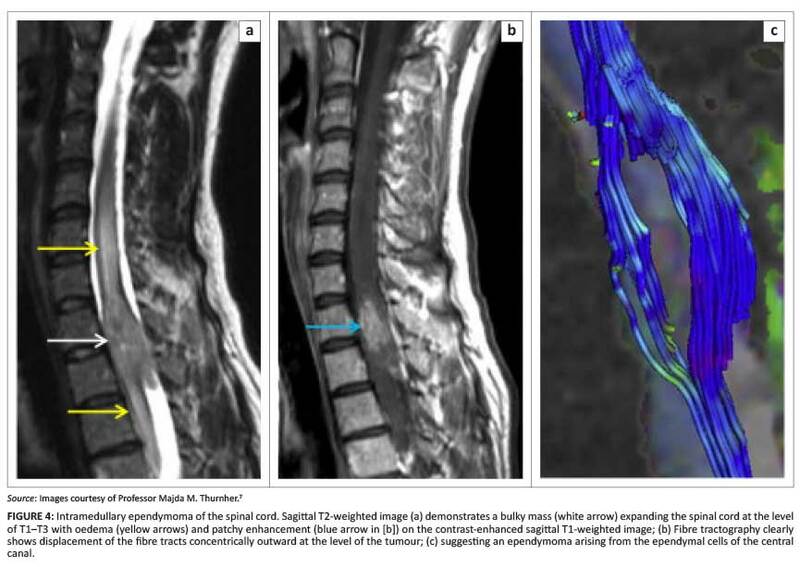 As cerebrospinal fluid (CSF) dissemination may occur, imaging of the entire neuraxis is recommended.2 Diffusor tensor imaging (fiber tractography) has been used to differentiate ependymomas, which displace rather than infiltrate white-matter tracts, from astrocytomas that disrupt the descending fibres (Figure 4).5,6 It is very difficult to distinguish ependymomas from astrocytomas on imaging, but Table 2 provides some detail that might help to simplify the process. 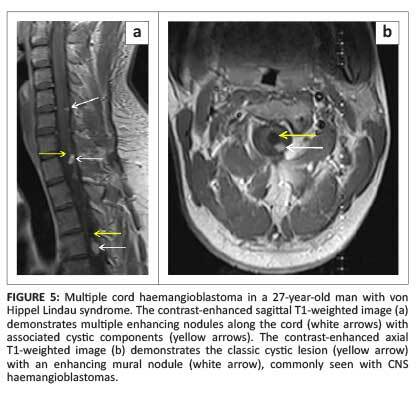 Most cord haemangioblastomas (80%) are solitary with multiple lesions indicative of von Hippel-Lindau syndrome (Figure 5a).1 These neoplasms are capillary-rich nodular masses abutting the leptomeninges, with prominent dilated and tortuous vessels on the cord surface (Figure 6). 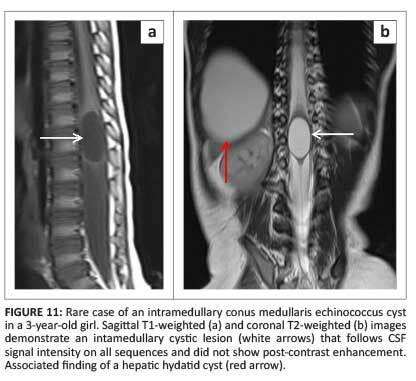 Their appearance may reflect the classic cystic lesion with an enhancing mural nodule, commonly seen in their intracranial counterparts (Figure 5b). 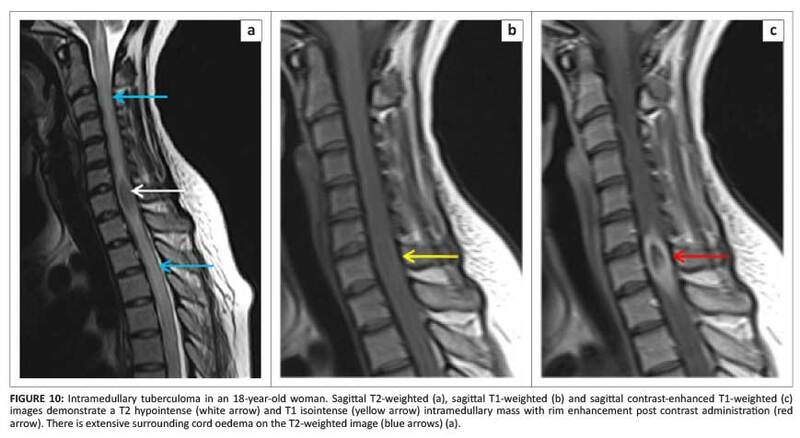 Syrinx and spinal cord oedema are characteristic findings even in small tumours.8 Imaging of the entire neuraxis is recommended for patients with a positive family history of von Hippel-Lindau syndrome. 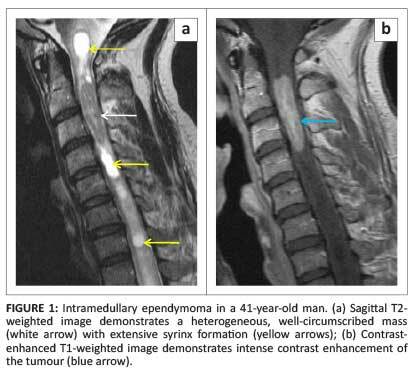 Paragangliomas are neuroendocrine neoplasms arising from paraganglia. Paraganglia are accessory organs of the peripheral nervous system.1 They are encapsulated, highly vascular neoplasms with a predilection for the conus medullaris, cauda equina and filum terminale.8 Haemorrhage produces the 'cap sign', and intratumoural vessels with flow voids are common features of this tumour. Occasionally the characteristic 'salt-and-pepper' appearance, similar to neck and skull base paragangliomas, may be seen. Intramedullary metastases are rare and most commonly secondary to bronchus and breast carcinoma (Figure 8).1 Cerebellar medulloblastoma has also been known to cause intramedullary metastasis.1 Spread may either be haematogenous or from the leptomeninges. Intramedullary metastases show avid post-contrast enhancement and profuse oedema which is often disproportionately extensive compared with the size of the lesion.8 Associated cysts are rare, compared with primary neoplasms. 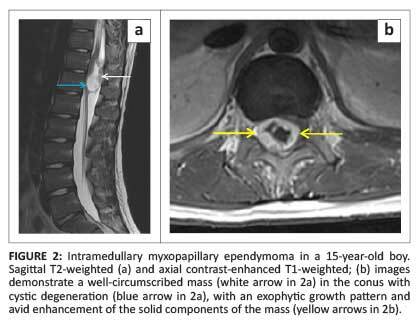 As cord expansion may be mild, differentiating intramedullary metastasis from demyelinating conditions can be difficult. 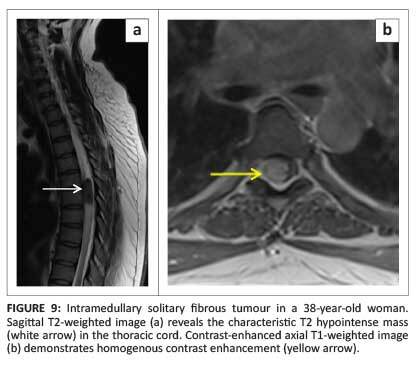 Intramedullary primitive neuroectodermal tumour (PNET) is a rare, aggressive embryonal tumour and is more commonly seen secondary to metastatic spread through the CSF from an intracranial primary tumour. 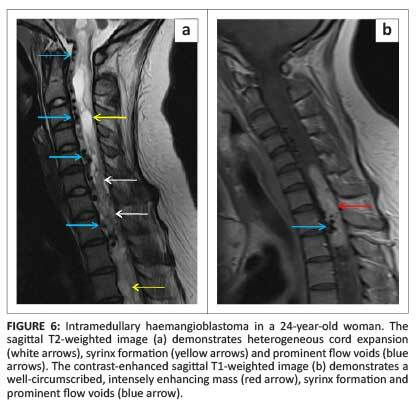 Intramedullary PNET is slightly more common in young adults than in children.2 MRI findings are non-specific including T1 hypointensity, T2 hyperintensity and avid post-contrast enhancement. Intramedullary lipomas consist of normal fat. 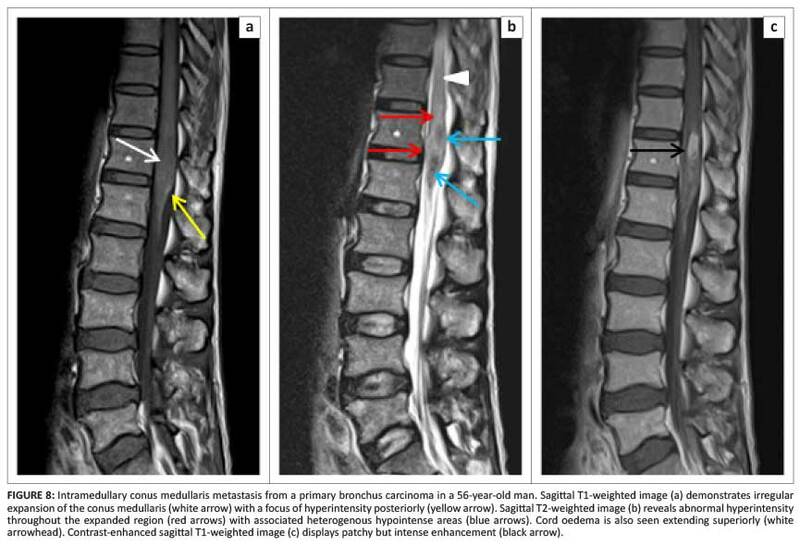 The pathophysiology of these lesions is poorly understood. 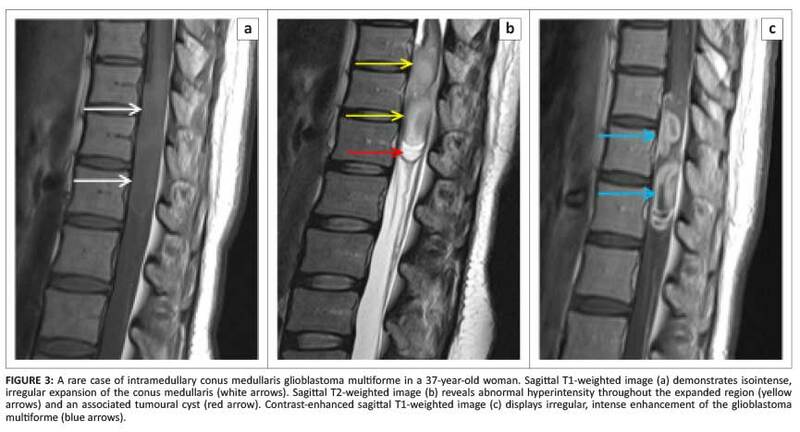 They usually occur along the dorsal midline of the spinal cord but rarely infiltrate the cord.14 They follow fat signal on all sequences and suppress on fat-supression sequences. A.F.B. (Stellenbosch University), J.M.L. (Stellenbosch University) and A-M.d.P. (Stellenbosch University) contributed equally to the writing of this article.